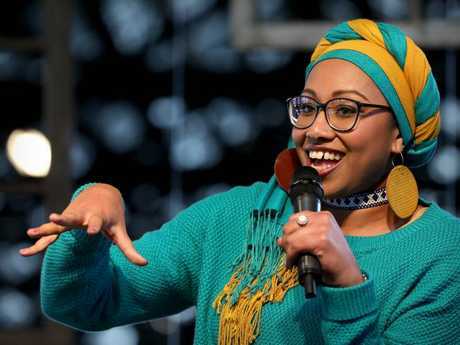 Human rights group Liberty Victoria yesterday announced that Ms Abdel-Magied was awarded the 2018 Young Voltaire Award for being a "role model" to young women, Muslims and migrants. "I won an award for Free Speech y'all," Ms Abdel-Magied wrote. "This one is for all those young Muslims and POC [people of colour] in Aus [sic] and around the world who know their equality is conditional, but know they need to speak anyway. "And for all of those who tried to silence me ... Eat your hearts out." The Institute of Public Affairs reportedly hit out at Liberty Victoria for giving Ms Abdel-Magied the award, but the group's president defended their decision saying she was a "worthy winner" who continues to rise in the face of "despicable" hate. 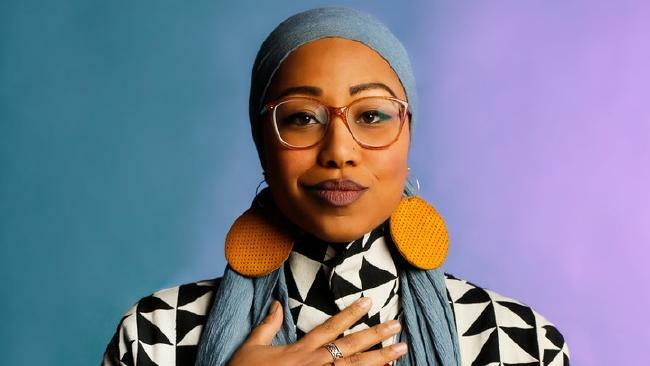 The no-money prize comes a matter of weeks after Australia's Human Rights Commission received a complaint about her social media use, Ms Abdel-Magied confirmed on Twitter last month. The 27-year-old Muslim fled the country last September after months of mounting controversies, which sparked when she famously announced on ABC's Q&A earlier last year: "Islam to me is the most feminist religion," during a debate with former Tasmanian senator Jackie Lambie. 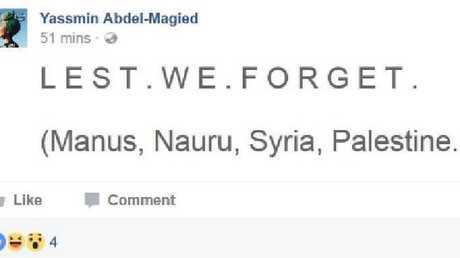 Ms Abdel-Magied caused even more controversy when she shone the spotlight on asylum seekers on Anzac Day posting: "Lest We Forget (Manus, Nauru, Syria, Palestine ...)." She deleted the Facebook post and apologised after a barrage of abuse over the 'insensitive tweet', telling The Project she had no idea how bad the reaction would be. A status from Yassmin Abdel Magied’s Facebook — which has since been deleted. "I thought, 'I will take it down and apologise'. There were comments underneath. I didn't look at it but I literally took a nap. It was the last nap I ever took," she said. "I was like, I fixed that. I am going to have a nap. It is a public holiday. I woke up and one of my friends messaged me and said, 'You are on the front page of The Australian'." It would seem she didn't learn from the experience, after tweeting a similar post on Remembrance Day. That same month, she was criticised for playing the victim and not acknowledge other people's feelings, after writing an opinion piece for Teen Vogue in which she claimed people of colour were considered "conditionally Australian" and "the moment they step out of line, the country explodes with outrage".